Week three...where does the time go? This class is so much fun and I am learning so much. So far there are not too many things that I had not done before but oh, it is so much easier with PSE. Things that take many steps to do in simpler programs are just a click or two away with this software. I am loving it! This time we learned about Overlays and Feathering and Blending. 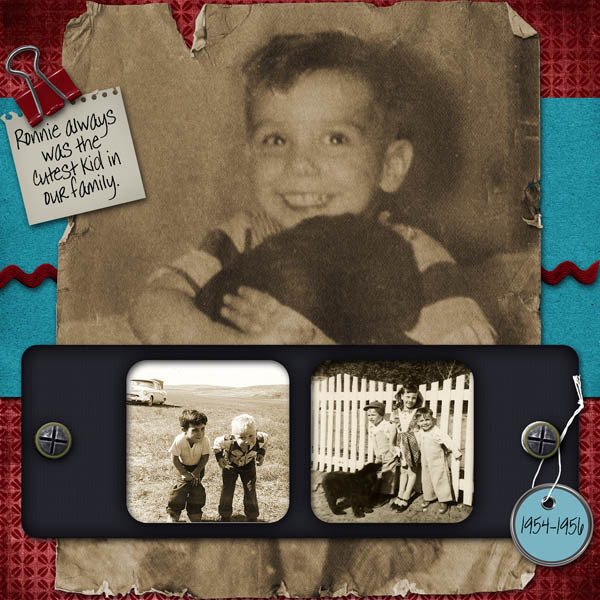 On this layout I created a background using two different papers blended together, then I added the photo of my little brother as an overlay and when it was welded all together I got this awesome tattered photo look. I used the Scraps-N-Pieces Collab Kit Twitterpated for this layout, a few extra elements came from Wendy Tunison's Thankful Hearts Kit, and the torn paper came from Keystone Scrap's Key to Happiness Kit - all available at Scraps-N-Pieces. This was a fun layout to do. Thanks, SNP for all the wonderful things I am learning.